Kooltronic has a broad range of models and configurations of enclosure fans, offering unsurpassed capability and flexibility. From the ultra-compact yet powerful Thin Fan Series (210 to 840 CFM capacities) to High Performance Fans capable of delivering far more air than comparably sized units. Kooltronic also offers Twin, Triple and Filter Box Packaged Fans (250 to 1310 CFM capacities) and KoolTrays with up to 9 Fans (315 to 945 CFM capacities). Our filter fan series includes NEMA ratings for virtually every application. The Advantage Series Filter Fans, with a NEMA 12 rating, are available in a variety of sizes and cooling capacities. The Advantage Sentry Series electrical control panel fans, rated for NEMA 3R, offer the versatility and convenience of indoor or outdoor cooling, and are available in a variety of sizes, voltages and protection levels for electrical control panels. Our exclusive Guardian/GuardianX Series Filter Fans are rated for NEMA 4 or 4X, and are perfect for wash-down environments, wastewater and other challenging applications where the electrical control panels only require enclosure fans to provide the cooling. However, if conditions require below ambient cooling of an enclosure, an air conditioner or a water-to-air heat exchanger should be considered, along with additional enclosure accessories that can help customize the unit. 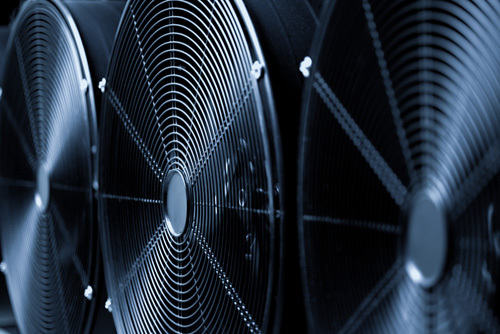 For proper enclosure cooling fan selection, it is important to consider the heat that needs to be removed from the electrical cabinet and the required airflow against static pressure to achieve the desired result. Space limitations, the enclosure NEMA requirements and available power voltage should also be considered. 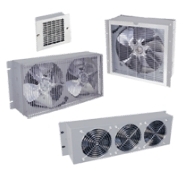 Accessories and options for enclosure fans include airflow detectors to alert users to low air volume, reverse airflows and replacement filters. Keeping the filters in enclosure fans clean will optimize airflow, resulting in better electrical cabinet cooling. Each enclosure fan is engineered for performance and built for reliability. All applicable components are UL/CSA Recognized. Popular electrical control panel fans are stocked and ready to ship. KOOLTRONIC also designs and manufactures a variety of enclosure fans to meet unique specifications. If this is something you may be interested in, please inquire about our modification and custom-design capabilities. Thin Fans -These uniquely compact and versatile fans are designed specifically for cooling electronics and are unsurpassed for their economy of space. Delivering from 210 to 840 CFM, these powerful fans provide a large volume of air to ensure a broad distribution of the cooling effect throughout an enclosure. Complementing these fans is a complete line of accessories. Kooltronic Thin Fans are designed for mounting in virtually any position, internally or externally. With or without accessories, these fans can be mounted directly to a panel or door of the electronics enclosure. Often they can be located in the base or top of the enclosure, leaving side walls and all or most of the panel space free. Each fan, whether a B Series or an S Series, can be used to either pressurize or exhaust the enclosure by simply reversing its orientation. 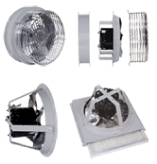 After selecting the basic model of fan for the performance required, the final choice will be determined by the differences in their configurations and dimensions, the preferred location for mounting and whether the need is to pressurize or exhaust the enclosure. Because of the numerous combinations of choices available, virtually any requirement can be met. Advantage Filter Fans - Designed for cooling the interior of cabinets containing electronics, the Advantage Series Filter Fans are a cost-effective solution for a variety of applications. Filter Fans can be used where filtered ambient air is acceptable, and where the equipment can tolerate temperatures slightly above ambient. Advantage Filter Fans feature durable, attractive plastic grilles which contribute to a clean, linear design. They also boast an extremely flat profile, which blends well with modern enclosures and keeps the unit from protruding from the cabinet wall. Guardian/GuardianX Series NEMA 4 or 4X Filter Fans - Kooltronic has expanded its line of filter fans to include models offering the security of NEMA 4 or 4X Ratings together with the versatility of indoor or outdoor use. All Guardian Series Filter Fans, with a NEMA 4X Rating, are offered with a Stainless Steel shell. The Guardian/GuardianX Series Indoor/Outdoor Filter Fans are a perfect choice for dissipating high heat loads economically. The new Guardian/GuardianX Series Indoor/Outdoor Filter Fans offer the same convenience, versatility and reliability as the Advantage and Sentry Series Filter Fans with the added protection of a NEMA 4 or 4X Rating, making these models an excellent choice for washdown, wastewater treatment and the food service industry. 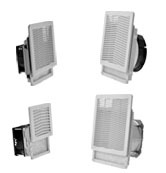 Advantage Sentry Series NEMA 3R Filter Fans - Kooltronic has expanded its line of filter fans to include models offering the versatility and security of indoor or outdoor use. These new additions to the Advantage Series Filter Fans have a NEMA 3R Rating and are a perfect choice for dissipating high heat loads economically. These filter fans are also available in a variety of sizes, voltages and protection levels. Packaged Fans - Twin and Triple Fans: In low static pressure applications, these fans provide high airflow in a very thin package. An exclusive Kooltronic design provides exceptionally quiet operation in both intake and exhaust applications. Whether mounted horizontally or vertically, these minimum vibration fans require little internal cabinet space, leaving virtually the entire cabinet free for power supplies or other components. Both the KP500 (Twin) and KP875 (Twin) fans fit standard 19-inch equipment racks. Reversible designs allow user to push or pull air through the enclosure. In addition, these fans can be installed internally or externally, vertically or horizontally, with or without a filter on either side. With the Kooltronic special motor mount isolation system, these fans operate virtually vibration-free. Front and rear grilles can be adjusted to accommodate or omit filter. Filters are easily removed for cleaning or replacement. High Performance Fans - These fans are ideal for applications where severe space limitations and restrictions are present. They are typically found in telecommunications and medical applications, industrial control and blade circuit board arrays. KB653: Within its recommended operating range (150 - 320 CFM), the KB653 fan provides more air than other fans of comparable size. It is also quieter, less costly and overcomes higher static pressures. It can be mounted to pressurize or exhaust the enclosure. (Pressurizing, with use of a filter, is preferred). KoolTray II -The Standard KoolTray II delivers cooling air to hot spots by localizing fan placement to the heat generating area(s). With its 1-3/4-inch [44.5mm] single-U height it fits right under card racks or near heat-producing sources. Standard units are available in 1, 2, or 3 row models. 19-inch [482.6mm] unit width is standard. Smart KoolTray II: In addition to specific cooling fan placement, the Smart KoolTray II provides two optional choices of component protection. The X5 option sends both a visual and external alarm in the event of fan failure or low fan speed. The X7 option varies the fan speed as temperature decreases or increases relative to the set point and sends an alarm for high temperature conditions. The X6 option combines both the X5 and the X7 options. Filtered KoolTray II: For environments which require filtration of the ambient or cabinet air, Kooltronic's Filtered KoolTray II filters the air from the bottom side of the tray. Other filter location options are available. Filtered versions are available on both the Standard and the Smart Kooltray II.